Many good points in your game, even if the gameplay is very simple and the fun a little bit away, I enjoyed your message, and I must say it warms my heart. By the way, the idea of a story that appears when you type is just very clever. 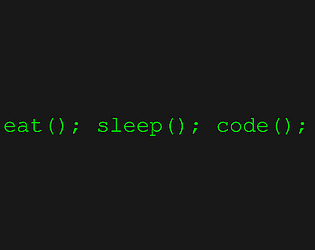 I just regret the lack of "gestion" between code, eat and sleep, I didn't saw the utility of "sleep (), eat() " for exemple. Anyway, it was still a good idea and experience. Didn't actually know you could spend money on food and spend time on sleep but I still liked it going in raw. 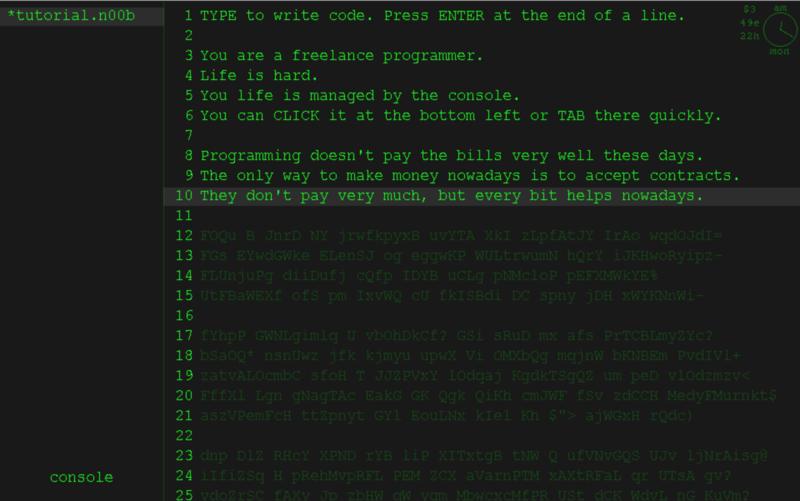 If there was a hidden story within the code itself, it went over my head as the gameplay itself told a story decently anyway. I just enjoyed mashing my keys, it doesn't need to be any more complicated than that, and now my hand hurt. I absolutely love the idea of a hidden story inside the code itself. Interesting idea and aestethically very cohesive, I was just not having a lot of fun playing. I don't know if it's a problem with the idea itself or if it could be improved to be more complex gameplay-wise. Feels a bit like a clicker without upgrades. Even with that, I love the concept and how its executed. I agree that this game can get boring pretty fast. Even as I was builing it I was thinking about how it could be more fun but quickly ran out of time. This game was also made for another jam simultaneously where the theme was basically clicker. Again, upgrades would make the game a whole lot more fun, but again ran out of time. Anyways glad you enjoyed the aesthetics(theres not much there though). I am probably going to be working on this over easter to see what i can do about the fun aspect being almost nonexistent.